Please note that you are viewing an archived issue of The KBzine. The RIBA + VitrA Talks series continues into 2019 with more emerging and established international voices in architecture. Last year leading bathroom brand VitrA announced the partnership with the Royal Institute of British Architects (RIBA) in the form of the RIBA + VitrA Talks series. A Voluntary Agreement for the Unified Water Label is a step closer after a programme for taps and showers was supported by the European Commission department DG Environment. Silestone by Cosentino, is adding to its popular Integrity by Silestone kitchen sink range with the new minimalist kitchen sink, Integrity Q.
Mereway Kitchens has launched a selection of new colours and finishes for its contemporary Cucina Colore collection, which are included within a stylish revamped brochure. British designer and manufacturer of premium radiators and towel warmers, Vogue (UK), presents the growing style trend 'New Traditional' with its Art Moderne II Towel Warmer: a pioneering heating solution that redefines traditional styling with a modern perspective. First in Danby's UK range arrived - and it's a Red Dot Award winner! Danby Appliances, Canada's principal household appliance manufacturer which announced its expansion to Europe in October, has revealed the first of its products to become available through distributors Exertis.co.uk. With the trend for nature-inspired materials, industrial lines and neutral colour palettes set to be strong in 2019, CRL Stone has added six new colours to its Ceralsio ceramic surface collection. Lustrolite's acrylic panels are one of the most suitable materials for bathroom and kitchen splashbacks. Not only do they have a sleek, modern look and finish; they are incredibly easy to clean and maintain. The panels are highly-resistant to harsh chemicals and can be cleaned with just warm water and a soft microfibre cloth. If clearing the clutter and transforming the kitchen into a minimal oasis is on the home improvement checklist this Spring, then investing in some clever storage solutions is the perfect way to achieve it, courtesy of The Signature Collection by Masterclass Kitchens. We'll be hearing a lot more about the 'The Poured Project' in future as KBB specialist The Lenny Agency has just been awarded the PR contract. CamuStyleTX, the latest collection from global decorative panel specialist Swiss Krono, has won the award for Excellent Product Design in the Material and Surfaces category of the prestigious German Design Awards 2019. Gorenje, the global Slovenian-based home electronics manufacturer, has joined the Hisense family of consumer electronics brands. 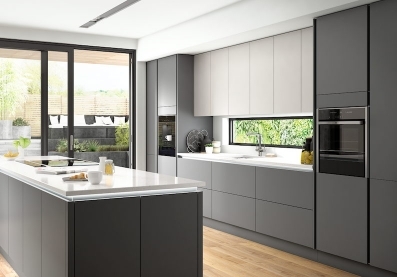 The Gorenje brand will continue to operate in the UK, with both sales and support continuing. The Istanbul collection designed for VitrA by Ross Lovegrove has been an international success since it was first launched in 2004. The sanitaryware and furniture collection draws its inspiration from the organic shapes found in nature and the fluidity of water. Keller's new Chelsea kitchen reflects a vintage style; with a modern twist. 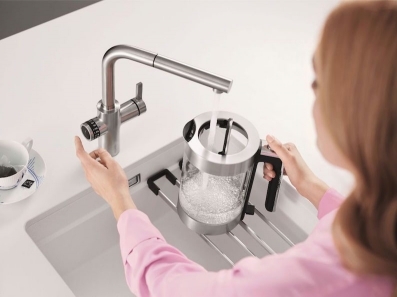 The beautiful, angular shape of Blanco's fashionable Luper tap brings a modern design to all kitchens. The cross-shaped mixer tap has ceramic disc control and provides a high-pressure water flow with a minimum of 0.5 bar pressure. Our industry makes some fabulous products, designed to make our lives easier and more enjoyable and more often the innovations are also designed to help protect the environment by using less energy and water (and, in the case of many products, making us think we're using the same volume of water when really, we're using a lot less). I sometimes wonder where it will all end... when we'll have reached that pinnacle of luxury and opulence and there'll be no more improvements left to make. As a consumer, I've always felt that the weak link has been in the fitting; that unless you're lucky (or clever) enough to employ a fitter who really knows the ropes, you're not going to get the best out of your purchase, however wonderful it might be. That's one of the reasons I'm behind trade bodies such as those in our industry, which are championing the need for comprehensive training and education and a recognised accreditation for those that have proved they won't let their trade body down; that they won't bring it into disrepute for poor workmanship, overcharging or bad customer service. I applaud the moves made by the British Institute of Kitchen, Bedroom & Bathroom Installation to ensure its members not only boast solid expertise, but that consumers are going to find it easier to access their local members in future (see its latest announcement, below). Although things may have changed in the interim, I'd never heard of a specialist accredited body for fitting these centerpieces of our homes, prior to joining this industry. We still have a long way to go before we reach the same level as 'Gas Safety' (ex-Corgi) fitter specification - but we're on our way. I also applaud the Kitchen Bathroom & Bedroom Specialists Association for getting behind the move to develop higher education apprenticeships for the furniture industry following the success of the Level 2 and Level 3 apprenticeships that have recently been developed. Recently the British Institute of Kitchen, Bedroom & Bathroom Installation has alluded to a big announcement which was scheduled for the Institute's Annual Conference at The Houses of Parliament. And the organisation did not disappoint the 100 industry representatives as it unveiled a new service which launches in the Spring. 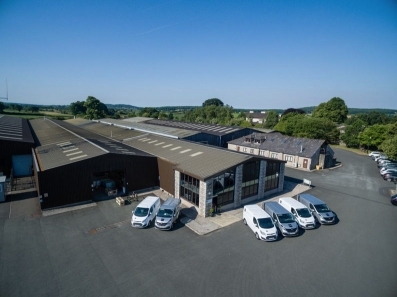 Reaffirming its commitment to helping the trade save time and money, Benchmarx Kitchens and Joinery is the first trade-only supplier of its type to add a transactional function to its website. Combined Independents (Holdings), an electrical buying group, part of Euronics, Europe's largest electrical buying group, has announced the European wide rebrand of Euronics has now taken effect in the UK. The UK rebrand encompasses a new logo, marketing materials, vehicle liveries, fasciae for members and a new website. Furthermore, the CIH reception has been refurbished to include kitchen furniture that is now available to CIH members through its unique partnership with DER KREIS (KBBG). Congratulations to Roger Cooper; Bathroom Brands' new chairman! Following the announcement of Clive Chaplin's retirement, Bathroom Brands Group has announced the appointment of Roger Cooper as the Group's non-executive chairman. 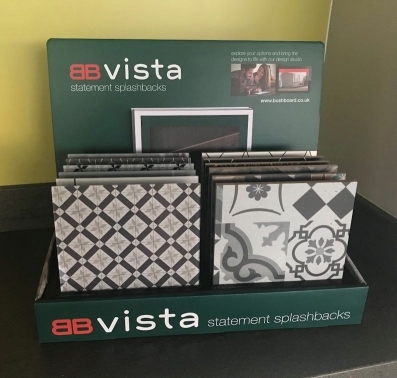 Bringing colour, pattern and a funky new look to kitchen walls, recently launched Vista splashbacks have been an outstanding success for Bushboard. Hundreds of kitchen specialists have listed the new range and there is now a fabulous array of Point of Sale material with which to promote it. Vista includes a compelling showroom lure like Summer Palms along with Moorish patterns, geometrics, weathered London brick, metro tiling and vintage prints (just some of the inspiring options in the new collection which includes 14 designs in 9mm mdf and six in 4mm acrylic). Crosswater's new Essentials collection offers deluxe bathroom suites at astonishingly good prices, without compromising on quality or function. Kai is the first range to join the collection; combining modern style with everyday usability, each component has been manufactured using the latest materials and water-control technology to ensure the ultimate bathing experience for every member of the family. UK manufacturer, Kudos Showering Products is marking its 20th year of trading with ambitious growth plans for the business. HiB is striking a chord for 2019 with the launch of a stunning musical ceiling light, designed to take a starring role in any bathroom. Rhythm combines sleek, minimalistic good looks with clever technology. Featuring a Bluetooth-enabled speaker, giving outstanding sound, Rhythm allows consumers to play music or news straight from their devices. The inclusion of a remote control also allows the user to adjust the volume or skip a track at the touch of a button. IDS has invested £350,000 in a state-of-the-art Hubtex EZK20 worktop picking platform for its warehouse in Newcastle-under-Lyme to improve efficiency and reduce energy consumption. The multi-directional picker allows operators to pick from both sides of the warehouse's cantilever racking, with the capacity for up to 450 worktops per day. Capable of picking a worktop load of up to 1500Kg from a height of up to eight metres, the custom-designed platform reduces the likelihood of damage and is safer and easier for operators to use. Get your copy of the Maurice Lay Distributors' trade price guide for a comprehensive collection of all its latest promotions, product details and pricing. Inside, you will find everything you need from high-performance appliances and durable sinks and taps to top quality kitchen and bedroom furniture. We keep an extensive archive of news stories and product information that have featured in past issues of The KBzine. If you would like to run a search of the The KBzine web site using the search tool below please just go ahead by entering in the name of the person, product or company or any other key words that you are looking for. The KBzine is broadcast every Friday. You may receive it FREE each week by clicking the link above. To prevent this newsletter from getting swept up by overzealous email filters, we suggest that you add news@thekbzine.com to your address book.